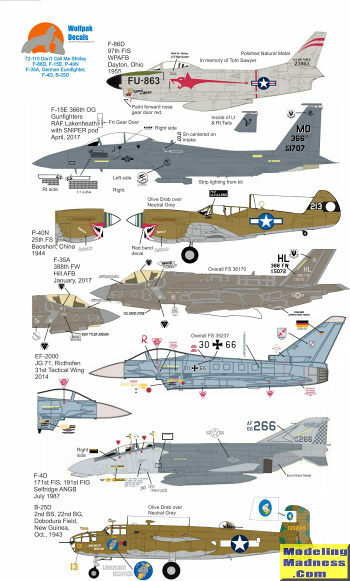 This sheet has another nice selection of mostly USAAF/USAF aircraft ranging from WWII until today. There are seven options so I would think that most of you would have little trouble finding something you like on this one. First up is an F-86D from the 97 FIS based at Wright Patterson in 1955. I think the USAFM plane is marked as this one. Next is a Strike Eagle from the 366 OG on deployment to Lakenheath in April 2017. This plane carries a SNIPER pod. A WWII option is next with this P-40N based at Baoshon China with the 25 FS in 1944. Note that most CBI fighters had the serial number on the tail overpainted. This one is named Shirley. A nice F-35A with the 388 FW at Hill AFB in Jan 2017 is next. A 'furriner' is next with this Eurofighter of JG 71 from 2014. It is with the 31st tactical wing which now carries the markings on the fin that used to be for JBG 31. Gotta have an F-4 and this F-4D with the 171FIS, Michigan ANG in 1987 fills the bill nicely. Finally, another WWII subject with a B-25D from the 2 BS/22 BW at Dobodura New Guinea in 1942. 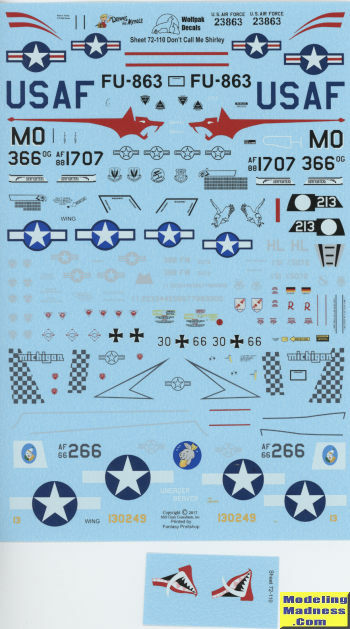 As you might expect, the decals are superbly printed by Fantasy Printshop. The sheet's outstanding instructions provides complete drawings of all these schemes to ensure that you will be able to duplicate them. Finding kits for all these options will not be difficult as there are fine kit available for all these options, though the SNIPER pod will probably have to come from aftermarket.